Do your library’s Twitter followers seem too quiet? Here are three best practices for increasing engagement with your patrons and followers on Twitter. According to Twitter, adding an image increases retweets 35%. Images make tweets standout! Include an original image, create images with a tool like Canva, or use free stock photos. Canva shared a list of 74 sources of free stock photos worth checking out. Video is a great way to increase engagement. Twitter reports video increases retweets 28%. Foster engagement with a behind the scenes tour of the library or a video from a recent program. For a 51% chance of a retweet, add the phrase Please Retweet to tweets. If the tweet does not have enough characters left, including Please RT also encourages retweets. If a retweet is not requested, the chance of a retweet drops to 12%. Get your patrons talking! 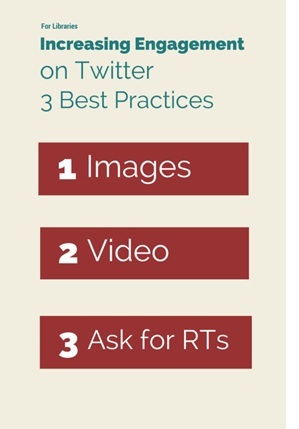 Employ these best practices to boost engagement on Twitter.